A test of outdoor warning sirens in Lewis County will take place this Thursday, August 2, at 10:00 a.m. The monthly test will also promote public awareness of four of the warning sirens located in Lewis County. These sirens are located at Tollesboro, Vanceburg, Black Oak, and Firebrick. These areas are some of the heavier populated communities where more residents are able to hear the sirens, said Emergency Management Director George Sparks. Each siren is capable of notifying the public in its area of a possible tornado or other imminent danger. During the monthly test, the Alert Tone (siren) will sound for 30 seconds. In conjunction with the sirens, WKKS will be conducting a monthly Emergency Alert System (EAS) test. This will notify residents that the sirens and EAS are only tests. We will also continue to publish in The Herald and post the reminders through our social media outlets. Judge Executive Todd Ruckel said the sirens at Black Oak and Firebrick were purchased and installed in the last couple of years through funding from Department of Homeland Security Grants. The most recently installed siren, located at the Tollesboro Fire House, was also paid for through Homeland Security grant funding administered by Buffalo Trace ADD, Ruckel said. The Tollesboro siren installation was completed last week. Ruckel said an application has been approved for funding to locate a warning siren at Garrison and he will continue to pursue grant funding with plans to locate the warning sirens in every community in the county. “We are limited to making only one application at a time to receive Homeland Security funding for these warning sirens,” Ruckel said. “I’m pleased we’ve been successful in securing the funding to date and I feel confident we will continue to receive grant approval for future application requests,” he added. The monthly tests is necessary to ensure the sirens are functioning properly and will operate if needed in an actual emergency situation. The sirens are intended to warn people who are outdoors of a possible tornado or other threat. The Homeland Security Grant Program plays an important role in the implementation of the National Preparedness System. In the event of poor weather conditions, such as rain or overcast weather on days of scheduled testing, the siren tests will be canceled or rescheduled. 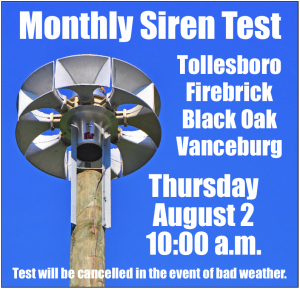 As a reminder, the county’s monthly tornado siren test will occur on the first Thursday of each month at 10:00 a.m. for Tollesboro, Vanceburg, Black Oak and Firebrick.